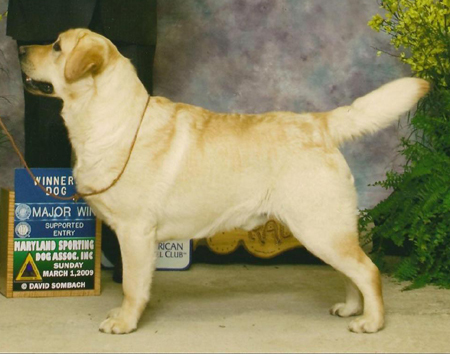 Judge's critique by Mrs. Heather Wiles-Fone (Heatherbourne Labradors) "Very stylish youngster with well defined head, alert expression, good reach of neck, great body with level topline, tail coming straight off the back, showed with verve." WD from 12-18 mo. Maryland Sporting Dog Association Judge David Flanagan 4 points! WD & JAM from 12-18 mo. AOC The Labrador Retriever Club of the Piedmont Judge Ms. Virginia Lynn 5 points!